Like a member of the family -- fifty years of care and still going strong! 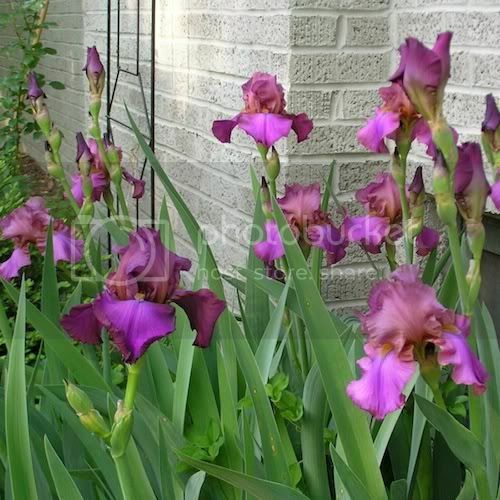 Mother’s Day has always been heralded by Mom’s irises bursting into giant grape popsicle blooms. The rhizomes of the waist-high bearded irises in my garden are offspring of those that she had planted beside my childhood home over 50 years ago. When Dad moved out of that house several years after Mom was gone, I wanted – more than any particular heirloom furniture or china – the heirloom irises that had bloomed every spring on the west side of our home along the driveway, greeting us with a riot of color as we stepped out of the car. I’ve continued to dig them up and carry them from home to home. They’re nothing like the showy hybrids that are such the gardening rage today. The buds wrap tight in a dark matte purple of cabbage or plums more than the more royal hue or the delicate lavender flounces of modern miniatures. The long falls drape with a slight ruffle on the edge, enlivened only by the rich gold and white beards enticing the pollinators in to the center of the flower. Mom didn’t have master gardener credentials. Tulips in the front planter were about as elaborate as she got. Throughout the years the yard harbored forsythia, bridal wreath spirea, lilacs, and bagworm-infested junipers. She let me plant vegetables almost every summer in holes our dog had dug in the back yard (I backfilled with more dirt), but they rarely produced a harvest because in my youthful impatience I dug up the carrots to see if they were ready then unsuccessfully replanted them so they could finish growing. But the irises propagated with abandon. On early summer evenings Mom was out there stabbing her garden fork into the tangled mass of iris plants and laying them out on the driveway for me to pull apart. I selected the largest for her to replant, all the fans facing in the same direction. The extras often made their way into the gardens of neighbors, family, and friends. Mom always had such a bounty to share. My garden has grown much larger than anything she ever attempted. I experiment with larger vegetable beds than my dog ever dug, herbs, wildflowers, shade gardens, butterfly plantings. My world is much larger too, with travel and college degrees and friends across distant borders. But by the front corner of my house, greeting the world of people who stroll past every day, is the colorful reminder of Mom’s ancient sturdy stock, which I’ll nurture for my children until they find a place to plant their own roots. And a few from those who came before. 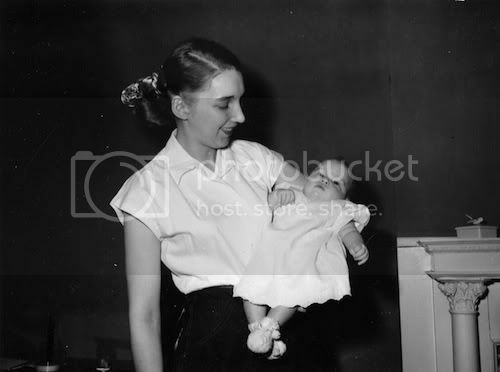 Now I leave you with a few thoughts by and about mothers. Feel free to share your own favorite quotations about motherhood, garden stories, or other thoughts in the comments section. "The buds wrap tight in a dark matte purple of cabbage or plums more than the more royal hue or the delicate lavender flounces of modern miniatures. The long falls drape with a slight ruffle on the edge, enlivened only by the rich gold and white beards enticing the pollinators in to the center of the flower." By far the most delicious description of bearded irises I've ever come across. I'm dizzy with pleasure. My mom's comment when my irises first bloomed: They look like spilled ice cream. So now you know why I drooled over your description. If I had written this today instead of over the weekend, it would have been all about ice cream peonies drizzled with just a touch of strawberry sauce. The peonies (almost as old as the house I now live in) burst into bloom this morning. Oh, and the moss roses! That will have to be another entry for my Grandma. My favorite too-hot-to-sit-on-the-porch summer flower.